August, 13, 1944. The British 8th Army occupies Florence. The Allies finally break out of Normandy. 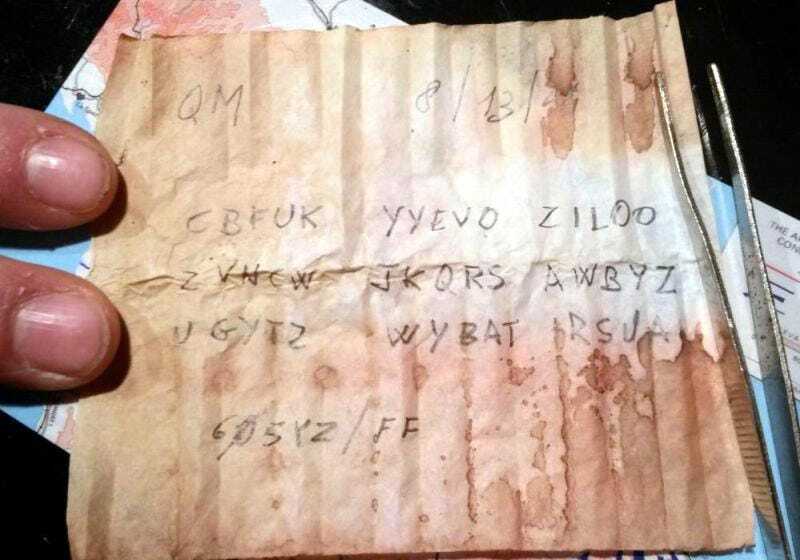 Meanwhile, somewhere in the south of Tuscany, a soldier writes this encrypted message and hides it inside a bullet. In 2015, someone found it and deciphered it. It was the end of a hilariously absurd story. Many people all over Europe dedicate their free time to find hidden WW1 and WW2 objects in old battlefields—a practice that is not welcomed by archeologists and associations of veterans alike. In fact, this practice is illegal in some countries. Yet, equipped with metal detectors and other treasure hunting gear, these guys go on to grab anything they can, from soldier ID tags to medals to helmets to machine guns to tanks to airplanes to secret Nazi research facilities. It's a hobby for some—and sometimes a very lucrative business for others. This time, a team of Italian metal detector fans found a few little treasures somewhere in the south of Tuscany. Like this insignia for the 372th Infantry Regiment of the 83rd Infantry Division, which apparently never fought in Italy but was carried by a soldier with the initials D.M. [...] the military used the shells to hide encoded messages (for radio equipment ciphers, for example) or recognition codes for the units themselves or positions of stations in the form of codes. The bullet was removed from the case and the powder charge discarded. Then they hid the note into the empty shell. Since ammunition could be found everywhere in the battlefield, these were very easy to hide, as they mixed with the rest of the ammunition. In case of capture it was easy to discard them and throw them away immediately. QM is code for the officer that was tasked with coordinating forces for a particular engagement. This is an engagement status letter that is addressed to that officer. Wait—the enemy was throwing grenades with their safety pins on and the American soldiers were grabbing and throwing them back with their safety pins removed? How the hell does this make any sense? But why would the Italian soldiers not remove the second pin? The only logical explanation is that the soldiers were not Italians. They were German. Most Italian forces were not fighting at this point in the war. On September 3, 1943, King Victor Emanuel III and Prime Minister Pietro Badoglio signed Italy's unconditional surrender in Cassibile. Some Italian troops remained loyal to Mussolini and kept fighting against the Allies. The Nazis confiscated all Italian war equipment too, including their grenades. By August 13, 1944, with Rome and Florence in the hands of the Allies, very few Italian soldiers were in the battlefield. And that's the only logical explanation to this absurd situation described in the encrypted message: These grenades were probably in the hands of German soldiers not familiar with Italian equipment, throwing them with their second safety pin on only to find them flying back at them a few seconds later, live and ready to shred them to pieces.